Varuna is the deity of water, which ties him to the sea, rivers, rain, and the creatures that live and swim in the water, along with the planet Neptune. He is the builder of order, but he is also linked with the primeval chaos that has, for generations, been associated with the sea and represented by the water creatures Varuna is associated with, such as the dragon, the crocodile, and the fantastical sea creature known as Makara. Varuna is more than just a water deity though. As I already mentioned, he is a builder and keeper of order, and his primary importance seems to have been as an ethical deity. He seems to me as a very contemplative and reflective deity, much like Shiva, but he also seems like an intelligent one too. For a deity associated with order, he also seems to be quite a balanced deity. When we usually have deities associated with law and order, they are usually pompous, intransigent, and zealous, they believe in order existing by itself, and in general it feels like they only give off an image of order, and a rather unpleasant one too. This usually seems to be the case for deities like Zeus, Athena, and Jehovah, and they are often petty and hypocritical, thinking they are above the very rules they established for others. But Varuna, in his association with chaos through mount Makara, clearly conveys and understands that the true order comes from a chaotic state, and is ultimately built upon it, but at the same time he keeps and enforces the natural order of things, and with the hypocrisy of thinking he stands above his own laws, making Varuna far more dynamic and impressive, head and shoulders above the other deities associated with order. To me, Varuna’s a deity that composes, builds order organically and intelligently, and upholds order and justice efficiently, rather than simply enforcing some lofty notion of order from on high that even he doesn’t believe in. Varuna is also a nocturnal deity, being very much linked with the night, and to me this makes him seem like a relaxed and enchanting deity as well who reminds me of the mystical appeal of night and the world of sleep. What differentiates him from Shiva for me is Shiva’s link with fire and pure creativity, but Varuna thinks out plans and principles that guide a created world. Being that Varuna was the original deity behind Ahura Mazda, Ashura might just be his cousin, and Varuna and Ashura being two expressions related to Ahura Mazda: one inclined towards water, peace, order, the other inclined towards warfare, aggression, and passion. Finally, I’d like to say it speaks volumes that Varuna is not very popular a deity because Varuna is an interesting deity to think about. That a brash, obnoxious deity like Indra turned out to be more popular than Varuna, and usurped him because of it, and set into motion his general unpopularity, is a sad thing, but it also adds some character. To me, Varuna is not a populist, and he doesn’t care about popular affairs. He’s in his own domain, the realm of water, the night sky, and peaceful contemplation, and he’s more interested ethical principles and proper governance than being the proverbial captain of the football team. To me, that’s inspiring and fascinating. Varuna represents a lot that goes together wonderfully, and I think Varuna deserves a lot more respect and appreciation than he usually gets. I must wonder what Hindu mythology would be like if Varuna replaced Vishnu as the preserver of the universe (he’d certainly make a more ethically fit preserver, in contrast to Vishnu who cheats and deceives the enemies of the devas out of a fair victory just so the devas stay on top because he favors them, as well as fancying himself to be above the law of the cosmos in spite of being its preserver). Thinking about it, Varuna doesn’t get in the way of my spiritual ideology or me being the builder of my own order. If anything, Varuna represents an important force of balance that, for me as Luciferian, ought to be important. You are probably wondering why I would embrace a water deity when I have such a strong affinity and preference for fire and heat while water quenches fire. It seems contradictory, but there’s actually good reasons for it. For starters, when I suffered from confusion about what made me who I am and what I identified with most, before I fully realized and embraced my affinity with fire, water was one of the elements I frequently attached myself to, often in more ways than earth or air, and I liked to swim when I was young. I still find aesthetic value in the water element, and the underwater world is pretty fascinating, and I even feel water compliments fire, heat, and the sun in a nice way. Just look at the depictions of yin and yang that feature water and fire. The sun even bestows the water of the sea and pools with such beautiful shades of blue. Also, as one of the essential building blocks of life, without which life on Earth is can’t exist, water is unavoidable (and to be honest, why would you want to avoid water?). Life as we know it began in the ocean, it is within the oceans that the ancestors of all land animals evolved legs, and it is from the ocean that said ancestors crawled out. If anything, I see water as an important complimentary element, and in my opinion it doesn’t extinguish my fire. In the early part of the Vedic age of Indian religion, Varuna was exalted as the supreme deity and ruler of the pantheon of deities. He was the builder and keeper of cosmic order and law, which was traditionally referred to as Rta. In the ancient Vedic religion, Rta was an abstract concept that referred to the order by the sun and moon move, and the seasons proceed, but it also referred to moral or religious law and the order of ritual sacrifice. Even the deities were subject to Rta, and no one, not even Varuna, had direct command over Rta, but Varuna was the chief deity charged with its perseverance. He was also seen the ruler of the primeval, undifferentiated chaos. He was the chief of a group of solar deities known as the Adityas, so named because they were the offspring of the Aditi, the mother of deities. While many of the deities where associated with natural forces, Varuna was more concerned with moral/social affairs, ethics, laws, and the way the cosmos is governed, though this is not to say Varuna didn’t have his own attachments to nature. His brother Mitra was associated daylight, particularly the morning sun, while Varuna was more associated with the night (which is ironic considering he was the leader of a group of solar deities). Mitra was also the keeper of social order in some way in his capacity as the deity of oaths and contracts, and he and Varuna were paired together as Mitra-Varuna. Varuna was also twinned with Indra during the new year, when they worked together to re-establish order. Varuna was also described as omniscient, as catching liars in his snares, and as watching the world and the movements of humans through the stars in the sky. He was even said to grant his devotees wisdom, particularly insight into the natural order of the cosmos, such wisdom was referred to as “medhira”. He was even the subject of rituals in which he is invoked for the forgiveness of transgressions. Varuna was also referred to as “Father Asura” in the Rig Veda, and as an omniscient and all-enveloping deity he seems to have been originally treated as a sky deity. Despite Varuna’s role in the Vedic religion and his status as the ruler of the heavens, Indra, the brash deity of weather, storms, and war, sometimes had more prominence in the Rig Veda and was even seen as more powerful than Varuna. Varuna also seemed to be more important when the laws of the physical and moral world were contemplated, but was not a strongly popular deity. Later in the Vedic period, Varuna was ousted from his original position, and Indra replaced him as the ruler of the heavens and the pantheon of deities. In later mythology, Indra even stole Varuna’s role as the governor of the cosmos after defeating Vritra for stealing the world’s water. Varuna became a water deity and took on a new role as the deity of oceans and rivers and the lord of the cosmic waters. He was also a deity of the night, the keeper of the souls of the drowned, and a lord of the underworld and the dead (a position shared by Yama, the lord of the departed). This Varuna was said to grant immortality, was attended by the nagas (serpents), and was seen as a guardian of the west direction. He was identified by some as the ruler of the nagas. He was even said to punish mortals who didn’t keep their word by capturing them with his noose and hanging them. His mount, or vahana (vehicle), was Makara, a kind of sea creature that had the attributes of many animals. Makara represented a chaotic state that order arises from, which may have implied that Varuna still had associations with cosmic order. Towards the end of the Vedic period, Varuna’s reputation began to change in another way. In the early part of the Vedic period, the term Asura simply referred to might and strength, specifically that of a deity or person. But eventually, Asura began to refer to a class of deities separate from the devas, and eventually the devas were seen as good, while the asuras were seen as evil. Varuna was one of the Vedic deities who fell under the category of Asura, so were the likes of Agni, Mitra, and Soma, but these deities also joined the ranks of the devas. Despite joining the devas, however, Varuna was still seen as a sinister deity, probably due to his association with death and being feared as a severe punisher of mortals. Eventually, Varuna would be forgotten almost entirely in India, as he and many of the other Vedic deities became eclipsed by the rise of Brahma, Vishnu, Shiva, and the Devi, and he became even less popular if he was even worshiped at all. Despite his lack of popularity, however, Varuna is currently worshiped by the Sindhi people, who identify him as Jhulelal. Varuna also appears in Indian astrology where he is associated with the planet Neptune, Varuna and Neptune both being sea deities after all, though this would be a modern connection since the planet Neptune was not recognized by the ancients. In Iran, things were entirely different for Varuna. You may remember that in India, Asura became bad and demonic while Deva became good and heavenly. In Iran, Asura became Ahura, and referred to godly entities and to the supreme deity of Zoroastrianism, Ahura Mazda, while Deva became Daeva and were seen as evil spirits. In fact, in Iran, Indra became a demon who opposed the concept of truth, though not the leader of evil spirits (that role goes to Angra Mainyu). Varuna, on the other hand, got a very big break and became identified with Ahura Mazda, the deity associated with order, justice, light, and truth. The original Varuna was Father Asura, the Asura par excellence and chief of the Asuras, and he was the wise one, who bestowed medhira, wisdom (particularly of the order of the cosmos) The word “medhira” became “mazda”, and asura became ahura, and Varuna, as Asura Medhira, became Ahura Mazda. It should be noted that the Ahura Mazda of Zoroastrianism shares important characteristics with the original Varuna; he is the deity charged with upholding order and justice, like Varuna, he is the deity associated with the cosmic principle of order, like Varuna (though in Zoroastrianism it is Ahura Mazda who creates this principle), he is exalted as the wise one, like Varuna, and he is exalted as the supreme deity and the ruler of the heavens and cosmos, which Varuna originally was. Ahura Mazda was also identified with Mitra and the composite deity Mitra-Varuna, although Mitra became his own divinity in Iran known as Mithra, and he was a divinity of contracts and oaths, judicial protector of truth, and guardian of cattle. Unlike some Hindu deities who get incarnated in Buddhist lore, Varuna does not have a lot of presence in Buddhism and is hardly mentioned. He certainly wasn’t very popular in China. I have read that in Tibet, Varuna appears as the ruler of nagas in the form of Apalala Nagarajah, and is treated as a lord of weather, but I can’t find a lot of information about Apalala Nagarajah, and whoever this deity is he seems to be an obscure deity and may have been considered a minor deity. Varuna himself may have been depicted as his own deity in Tibet, but from what I have read he was likely treated as a minor deity. 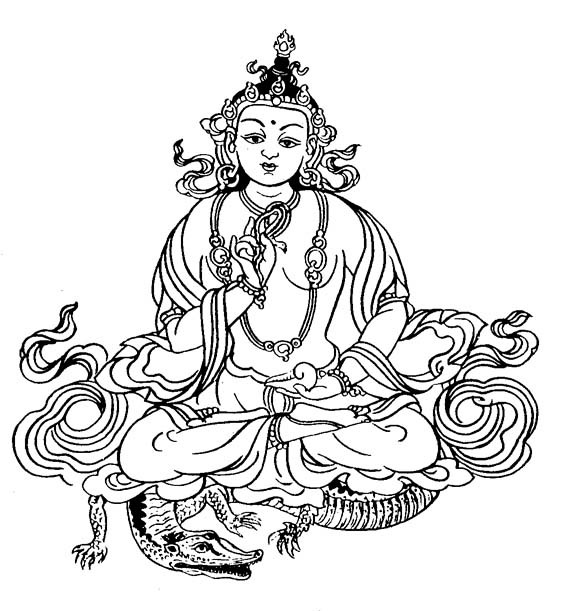 Varuna does appear in Japanese Buddhism as Suiten, a deva of water much like the late Vedic incarnation of Varuna. Suiten is one of 12 devas who protect the eight directions, up and down, and the sun and moon, and he is specificially the guardian of west direction. However, Suiten does not enjoy a lot of popularity in Japanese Buddhism, though in Japan this might be due to the presence of more popular water deities such as Suijin (aka Mizu no Kamisama), who is known as a benevolent water goddess, and Benzaiten, who is actually the Japanese Buddhist incarnation of the Hindu goddess Saraswati. I’d also like to mention that Varuna’s mount Makara is also incarnated in Japan as a creature known as the Shachihoko, a creature depicted as a fish with the head of a tiger or a dragon. Fun fact: the name Shachihoko literally means “killer whale”. The Shachihoko was frequently utilized as a roof ornament found on castles, tower gates, and the homes of samurai during the Edo period, and the creature was thought to bestow protection against fire and have the power to control rain. In Japanese art, the Shachihoko also sometimes substitutes the dragon in paintings of Ryuzu Kannon, a form of the hugely popular bodhisattva and goddess of mercy Kannon (the Japanese form of Guanyin, another name of the bodhisattva Avalokiteshvara) who usually rides on the back of a dragon or sea turtle. The theme behind Ryuzu Kannon paintings that feature Shachihoko are usually inspired by the Chinese legend of carp swimming towards the Dragon Gate and becoming dragons. Here’s an interesting fact: in Japan, the dragon (there called Ryu) is closely associated with water, and though it directly originates from the Chinese dragon, they are related to the Indian serpent beings known as Nagas, whom Varuna was sometimes identified as ruling.